Control panel is a popular tool used to manage your hosting package. You can do all sorts of things with it: manage your domain names, install applications, create and manage email accounts, upload website’s files etc. Of course, you can do all of this directly by logging to the server. However, this requires some development knowledge. One mistake – and the whole site may be broken. Moreover, web panels are usually intuitive and simple and save your time. You can find lots of panels on the internet. All of them have different design and scope of features. In this article Hostings.info team will describe the most commonly used and comfortable panels. By the way, you can find control panel ratings on Hostings.info. This panel is available only for Linux OS. It’s one of the most popular control panels. It has both a graphical interface and server management interface through WHM (Web Host Manager). 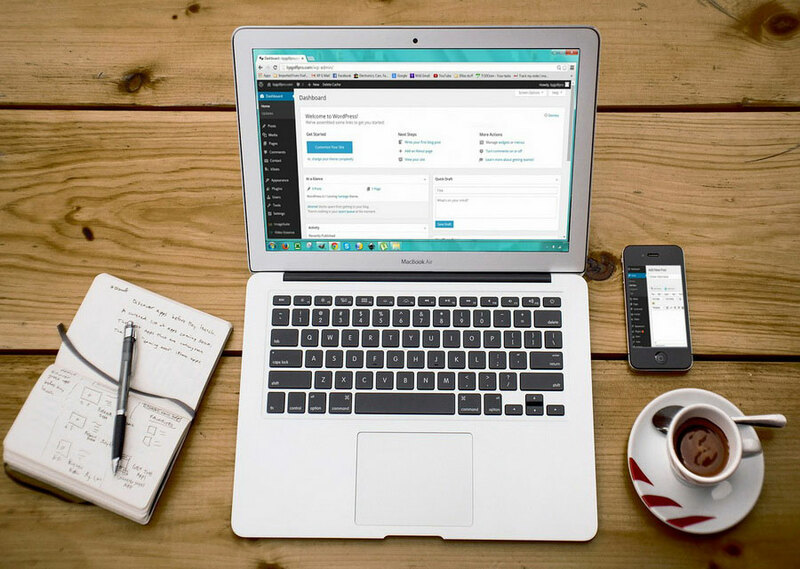 As these environments work together, it is possible to manage your website in either of them. So, it is perfectly suitable for both beginners and developers that prefer console rather than pretty design. Lots of third-party apps and tools to extend functionality. Available for Windows and Linux. It’s also quite popular, especially amongst European hosting providers. Basically, there are not many control panels offered for Windows. That’s why Plesk can be considered as one of the most comfortable and easy panel for this particular OS. All of the options are divided into different categories. They are displayed in the form of a list on the left side. Multiple servers can be managed in one panel. The interface is quite simple and intuitive, everything can be created in a few clicks. One of its distinctive features is the variety of automation tools. They will spare your time and resources, so you can focus on your website development and don’t worry about server maintaining. 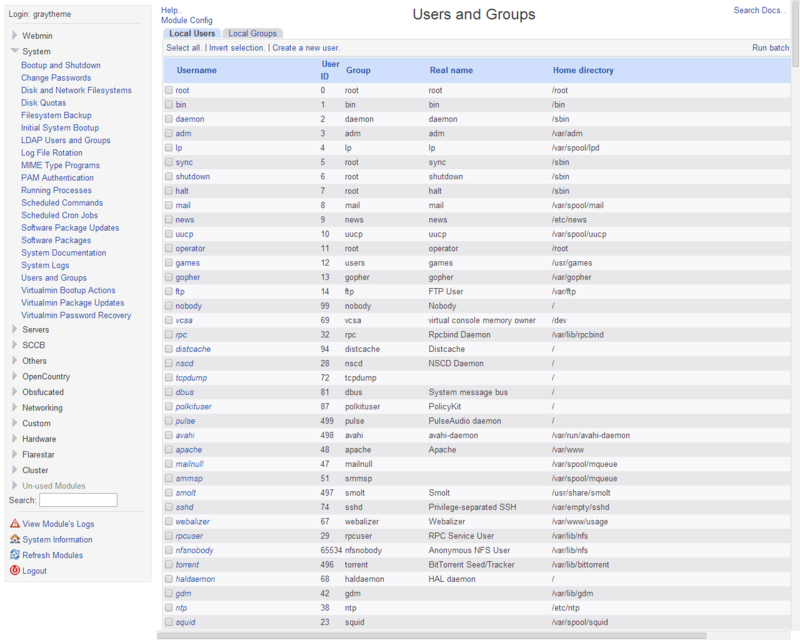 Mail User – the lowest level, possible to log in to webmail interface and manage passwords, spam filters etc. 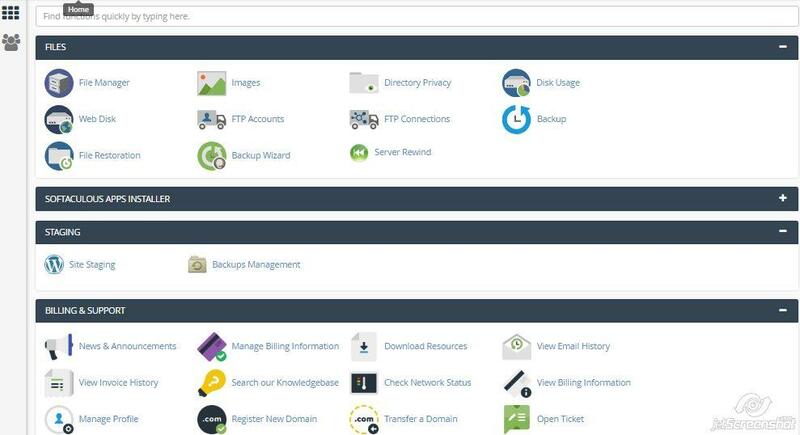 cPanel and Plesk panels are the most popular and commonly used panels worldwide. However, there are still dozens of them. Some companies create their own control panels for their customers. 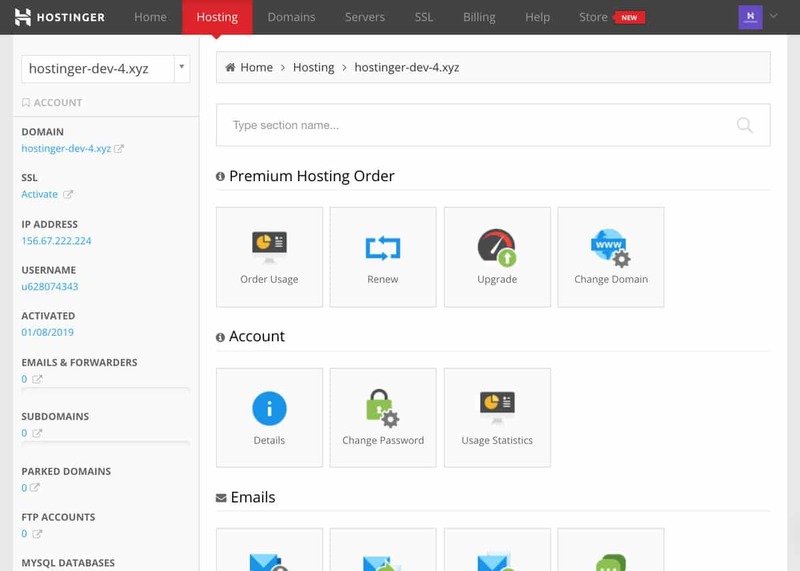 For example, Hostinger has designed hPanel. You can find it’s description below. This is a control panel designed by Hostinger team for their clients. It is available for Linux distributives. Also, hPanel can be used only for shared hosting at the moment. hPanel looks a bit like cPanel, however, a more comfortable version. For instance, although all of the options are located on the front page, when you select one of them, a side menu appears on the left. So it’ll be easier to navigate between different sections. This web panel has all of the basic functions that you need, such as domain and email management, DNS zone editor, file and database manager etc. You can also manage your account security: set up passwords for directories, block IPs and configure hotlink protection. Apart from all of these options, it’s the main peculiarity is the possibility to manage all of your products in one panel. For example, it’s possible to view your payment history, buy new hosting packages and upgrade them. It’s available for Linux and BSD systems. It is one of the easiest, fastest and most stable panels. Its interface is very user-friendly. Plus, it’s one of the cheapest as well. All of the options are categorized and located on the top. This control panel also supports multiple access levels: Administrator, User, and Reseller. In addition, it has built-in anti-spam tools. Moreover, it is possible to view the complete usage statistics of each resource. Basically, it has a lot of options and features, such as DNS management, database creation, and management, reseller account creation and management, backup creation, file management etc. But the main peculiarity of this panel is its simplicity. You don’t have to be tech-savvy at all to understand and use it. This web panel is available for all Unix systems, including but not limited to BSD systems, all Linux and Solaris systems. Moreover, it is partially available for Windows OS. This means that it is possible to install Webmin on Windows, however, not all of the functions will be displayed. Virtualmin – used to manage multiple virtual hosts (like Plesk). Webmin may not be as comfortable as other panels described in this article but it is absolutely free and can be installed on the majority of operating systems. It is a Linux-based control panel widely used among Eastern European hosting companies. Has a very simple and basic design but that does not make it less comfortable. There are two versions of this web panel: Lite and Business. The first one, Lite, apart from other features that are more or less common for each panel, can be used for web-server management, creating users with different access levels, importing data from remote servers etc. Due to this, the Lite panel is mostly used for Dedicated and VPS servers. As for Business ISPmanager version, it’s better for shared or reseller hosting as it allows to manage multiple servers (clusters) and easily create and manage user accounts. All of the above-mentioned panels have their own peculiarities, pros, and cons. It is quite hard to determine which one is the best. This is a matter of choice. However, these web panels have one common feature: they make managing servers and hosting easier and quicker. That’s why they are a good solution for both beginners and developers. A young and ambitious content-writer, hosting expert and a proud member of Hostings.info team. With perfect tech skills, she is open-minded and straightforward in her writing, striving to provide insightful information to the readers. Thanks to her ability to accurately determine the audience's priorities, each piece of writing serves as an entertaining yet in-depth analysis that helps readers to make the best decision for their needs.